General Tso's Veal Sweetbreads. Swamp Critters Provencale. Sweet Potato Beignets. Redneck Rockefeller Oysters. Jalapeno Peach Slaw. Those are just some of the tantalizing offerings on the appetizer menu at Purple Poulet, the new southern-inspired bistro that opened its doors at 603 Sixth Avenue in Dayton. 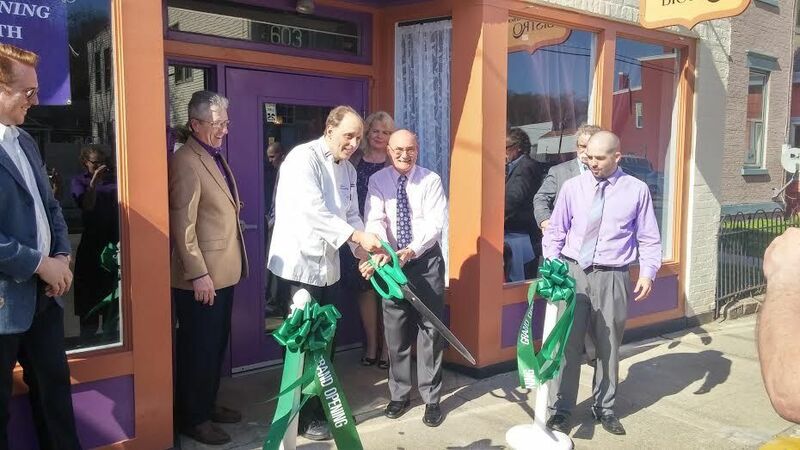 City leaders joined owner/chef Rick Zumwalde to cut the ribbon on the new restaurant, first announced last summer. "It's been a long time coming. The closer we got, the more stressful it got, so I guess all of sudden we're finally here and it's a load off," Zumwalde said as locals poked their heads around the beautifully renovated building, decked out in purple accents, complete with a shiny and inviting bar, a cozy corner table in the window next to a fireplace, and a long stretch of closely placed tables waiting for customers who are looking for a new dining experience in the River Cities. "This is a combination of things I like to do, with the central theme being southern," Zumwalde explained. In a profile published by The River City News last July the chef talked about his experiences in the restaurant business and how he came to love preparing fried chicken - but differently than others may think of it. And that is exactly what has been created on Sixth Avenue at Purple Poulet (poulet is the French word for "chicken" and purple is the color of a chandelier his wife picked up and loved, and is now inside the bistro) where fans of menus in New Orleans, Charleston, or even grandma's Campbell County kitchen will see recognizable decadence. In addition to tempting appetizers, which include fresh baked biscuits with ham or egg, the entrees will be the main act at Purple Poulet. "Chef Z's Southern Supper" options include shrimp and grits, hot browns, and bourbon fried catfish. There are Po Boys and big burgers, and sides like mashed sweet potatoes, green beans & ham hock, cider simmered collards, and Creole grits. Oh, and of course, five variations of fried chicken dinners. The "Claim to Fame" is four pieces of chicken with green beans, buttermilk bacon-whipped potatoes, and black pepper gravy. "Fricassee of Bird in a Nest" features root vegetables and those potatoes. The Fried Chicken and Waffle comes with half a chicken, a sweet potato-bacon cornbread waffle, pecan butter and maple-bourbon syrup. "The Kentucky Coq au Vin Drunkin' Bird" is a bourbon-brised breast with red wine bacon gravy, mushrooms, and Creole grits. The Funky Pecan Purple Chicken fills you up with berry brine and demi, allouette ham stuffing, and bourbon mashed sweet potatoes. And if that ain't enough, the desserts are written on a chalk board, giving the impression that they will be changed up. On Tuesday, bread pudding was one of the options. 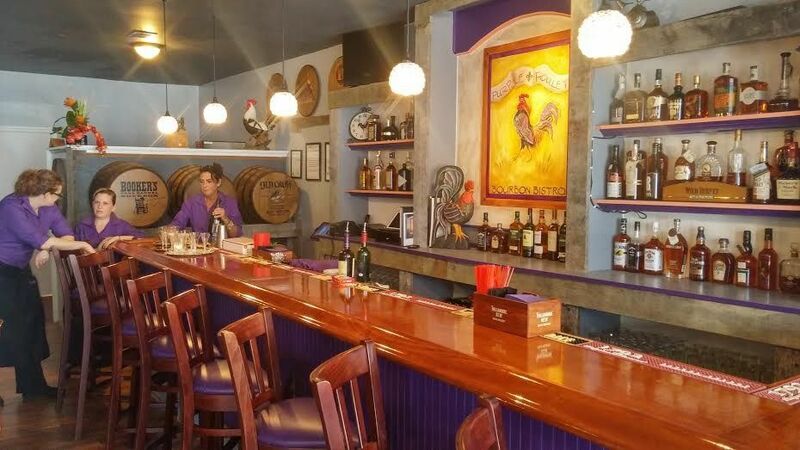 The addition of Purple Poulet to the menu of Dayton's central business district is a coup for a city working diligently to fill vacant storefronts and to attract new enterprise. Last year, the city council adopted an aggressive incentive program that assists businesses seeking to locate there. Purple Poulet is the sixth opening since the program's adoption. "This is one of the first applications we received and we were really excited about it," said Dayton City Administrator Michael Giffen. Councilman Joe Neary said that Zumwalde's dream of having his own restaurant matched perfectly with Dayton's dream of bringing new businesses to town. "Everyone's efforts are making our city an even better place to live an work," Neary said, thanking city employees and businesses old and new. "Our city has a vibrant and diverse mix of merchants, restaurants, services, and industries." 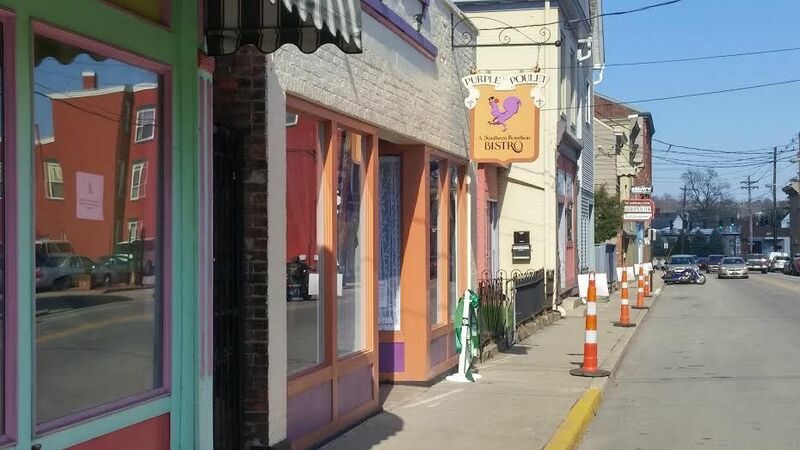 Purple Poulet will need to develop a following in and outside of Dayton to survive and Zumwalde knows that. It is designed to be a culinary destination and with its price points (fried chicken dinners start at $16 and other entrees range from $15 to $32), the new bistro is making a statement that the food served inside is worth the trip to Dayton. "If people are into southern traditions with a slightly different interpretation, they will enjoy it," Zumwalde said. "We need to get the word out. Hopefully people will come in, they'll enjoy themselves, and they will tell other people." 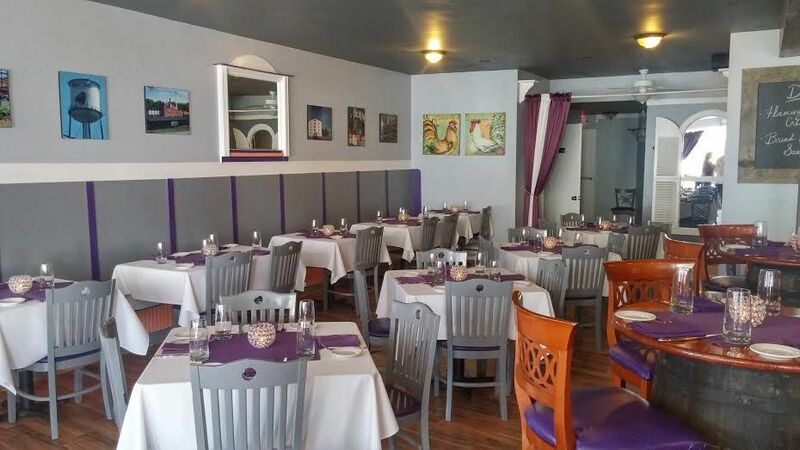 Purple Poulet is located at 603 Sixth Avenue in Dayton, KY and is open 5 p.m. to 10 p.m. Tuesday through Saturday.